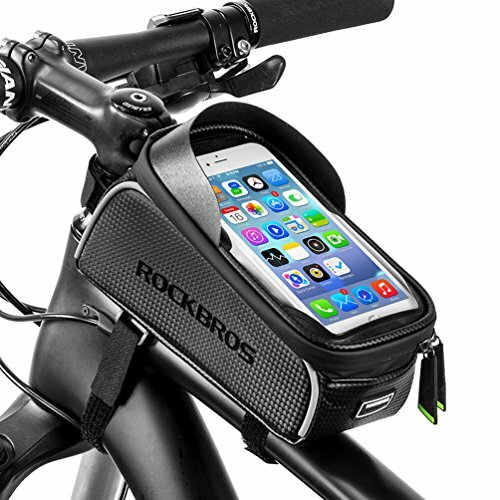 RockBros Bike Bag, Bicycle Top Tube Bag, Cycling Frame Pannier, Cellphone Holder Mount, Carbon Fiber, Water Resistant, High Sensitive Touch, Mobile Phone Bag Fits Phones For 6"
Fits phone size for 6" below. Made of composite carbon polyester,durable and water resistant. Sealed double zippers closure to prevent water and dirty enter in. The sun visor and flashing board is great use for rainy or sunny day. Large capacity can put any small things that you want to take it with you. TPU film window offer high sensitive touch screen. 3 velcro straps are long enough to sturdy hold the bike bag on the bike,it doesn't move around when tightened it doesn't move around when tightened. Both sides of bags reflective tapes to protect night ride safety. BIG SPACE: enough inside room for long rides,holds a lot of stuff i.e phone,battery,energy gel,small tire pump,repair kits, keys,wallet etc. If you have any questions about this product by ROCK BROS, contact us by completing and submitting the form below. If you are looking for a specif part number, please include it with your message.